Football was a different world in the 1950s than it is today in the 21st century and that is never more evident than how some of the players were scouted over half a century ago. In 1951, a young Leyland man was doing probably what most young Leyland men did; he was serving an apprenticeship at Leyland Motors. His apprenticeship was a coach painter but he was also a decent footballer and played for the works team at outside-left. The Burnley scouts had him in their sights and as he continued to impress we moved in and so, in April 1951, Brian Pilkington became a Burnley player. Pilkington had just passed his 18th birthday and was certainly considered one for the future by manager Frank Hill and he started his Burnley career as a reserve team player. By the start of the 1952/53 season, over a year after joining the club, he was pushing towards the first team, and when regular winger Billy Elliott was away playing for the Football League in September 1952 it was Pilkington who Hill turned to for a debut against Spurs at White Hart Lane. It couldn't have been a much tougher debut as he came up against the England right-back Alf Ramsey. Burnley lost the game but Pilkington played well. Elliott went straight back into the team but such was his performance in that game, and in his four other games that season, there was now real competition for the number 11 shirt. Hill must have had real confidence in the now 20-year-old, enough confidence to be prepared to sell crowd favourite Elliott to Sunderland in the summer of 1953 leaving Pilkington as the new first choice. They were different kinds of player. The diminutive Pilkington was very quick and also very direct. Besides having the ability to get on the outside of the full backs to get in telling crosses, he was also very adept at coming inside to get shots at goal. He scored nine league and cup goals in this first season, every one of them at Turf Moor, but it was a season total he would equal or better in all but one season during his Burnley career. Once in the side at Burnley he was very much a regular and his performances were soon attracting the England selectors. By the end of his first season in the Burnley first team he'd been called up to play for England 'B' against the Scottish at Sunderland's Roker Park and in October 1954 he was given his full England debut against Northern Ireland at Windsor Park. He came in for Tom Finney that day. England had some top wingers during that period and that surely had to be the only reason that it proved to be Pilkington's only England cap. Frank Hill was replaced by Alan Brown as manager, then it was Billy Dougall before finally Harry Potts took charge. It made no difference who the manager was, Pilkington remained in the first team as changes elsewhere during the 1950s saw the Burnley team get stronger and stronger. 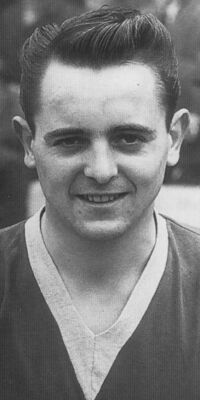 He missed just one game during Burnley's triumphant season of 1959/60; he was ruled out of the 0-0 draw at West Brom through injury in January and replaced by Gordon Harris, and he very much left his mark on Burnley FC history in the very last game of the season at Maine Road against Manchester City. As Burnley held its breath with the club searching for the win that would see us League Champions for the second time in our history, it was Pilkington who gave us the early lead with a real trademark Pilkington goal, cutting in and hitting his shot across goalkeeper Bert Trautmann, City's German goalkeeper. Nothing changed for Pilky in the following season as Burnley chased honours on four fronts. The only player from the Championship team to have lost his place was Tommy Cummings with Jimmy Adamson moving to centre-half with Walter Joyce coming in at right-half. Harris was doing well in the reserves but there seemed no sign of any change in that left wing position in the first team as Pilkington continued to play well. He was very much the star of our win against Hamburg in first leg of our European Cup quarter-final at Turf Moor in January 1961, scoring twice in the 3-1 victory including one super strike from the left hand side at the cricket field end of the ground. Pilkington played only another half dozen games for the club, making his last appearance in a 4-0 FA Cup win against Swansea Town in February. By the time we reached West Germany for the second leg of the Hamburg tie he'd been sold to Bolton Wanderers. As a youngster in my early days of watching Burnley I was stunned. He was the first player I'd seen sold and I couldn't quite understand it. Why would we sell such a good player; a player who had played 340 times for us and scored no less than 77 goals. Like all young Burnley supporters growing up in the 1960s I soon learned that's what we did. We sold players. Pilkington had been sold against his wishes, but that's how it was then and he went on to play for Bolton for three years, and three years that he later admitted were not enjoyable. He'd loved playing in Burnley's footballing side but Bolton were not of the same quality and played a much different style of play that didn't suit Pilky. We'd got £25,000 for him and with Harris waiting in the wings it was probably good business, just as it had been almost eight years earlier when we'd sold Elliott to allow Pilkington to make his mark. After three years he went on to play for Bury and then Barrow in the Football League before retiring from the full time game and returning to where it all started at Leyland Motors. He later managed the works team as he did Chorley before retiring from the game altogether. He became a successful businessman in Chorley and also a magistrate, and he's never lost that keen interest in football or Burnley Football Club where, for almost eight years, he was part of one of the finest teams we've ever seen at Turf Moor.